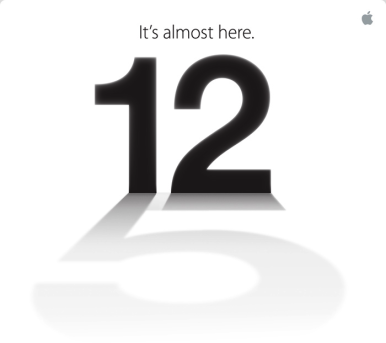 As Apple’s invitation read, “It’s almost here.” On Wednesday, Apple will almost assuredly unveil the iPhone 5 at a press event in San Francisco. Macworld, of course, will offer live coverage right here, with senior editor Dan Moren and editorial director Jason Snell both reporting directly from the Yerba Buena Center for the Arts Theater, beginning shortly before the event itself kicks off at 10 a.m. Pacific/1 p.m. Eastern. Apple’s invitation didn’t leave much to the imagination; the five in shadow—not to mention the calendar—makes it clear that Apple CEO Tim Cook and friends will unveil the eagerly anticipated iPhone 5 at the event. As we wrote last week, we think it’s likely that the new iPhone will sport a 4-inch screen, LTE support, and the long-rumored smaller dock connector port. If past is prologue, Wednesday’s event will also include some updates on iOS 6, including a release date. There’s plenty we already know about iOS 6, and we assume it will get released to the masses in advance of the iPhone 5’s actual launch; our prediction is that Apple will release both before September concludes. When Apple unveiled the iPhone 4S, it was Phil Schiller—the company’s senior vice president of worldwide product marketing—who first showed off the device onstage. If Wednesday’s event follows the same approach, Cook will come out first to crow about Apple’s sales numbers and iPhone adoption, and then introduce Schiller to show off whatever the company is “really excited about” that day. It’s always possible that another Apple hardware product or two could share the spotlight—but don’t hold your breath. The iPhone is a major rainmaker for the company, and Apple may well want to focus as much attention on that one product as it can. For years, the company has kept the venerable 3GS as its “free with two-year contract” phone in the U.S.; whether the lineup will shift to iPhone 4 (free), iPhone 4S ($99), and iPhone 5 ($199) remains to be seen. Regardless of what Apple announces Wednesday, Macworld will cover the event live as it happens, with analysis to follow over the days to come.